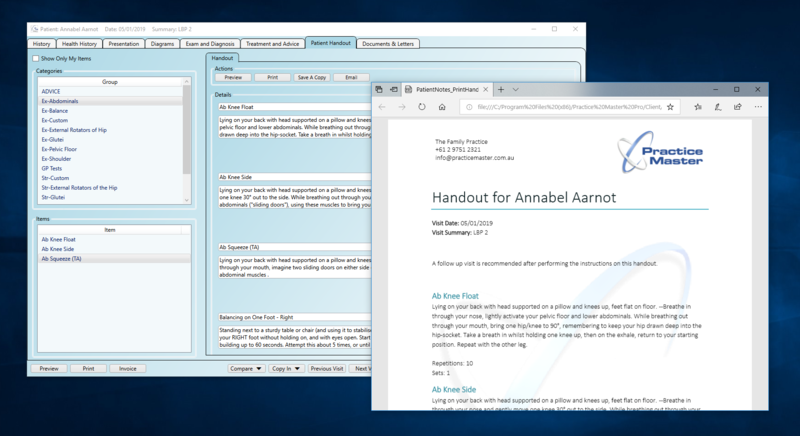 Practice Master can streamline your patient notes and move everything in to one place where much of the repetitive work is done for you. For example, you can copy notes in from previous visits to save re-entering data that is much the same. There are lots of options to speed up your note taking from tick box questions to text questions with pre-defined answers. 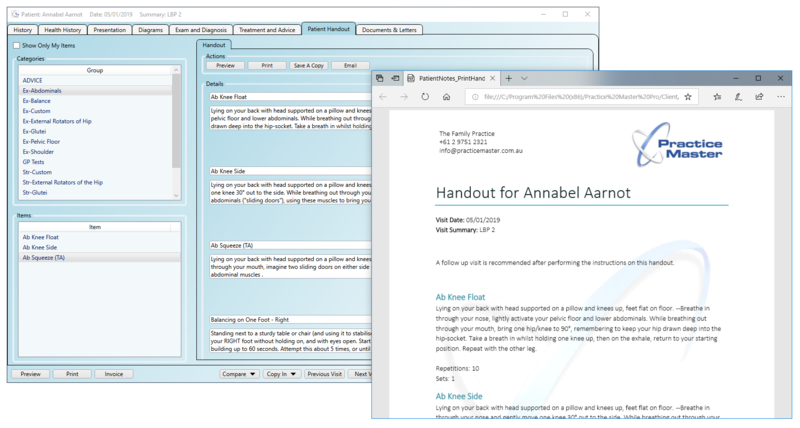 If you provide your patients with handouts or any other form of information to take home then you can use the handouts screen and/or the document generation features and built-in email integration instead of relying on manual copy-paste-edit methods you are probably already using in your practice. 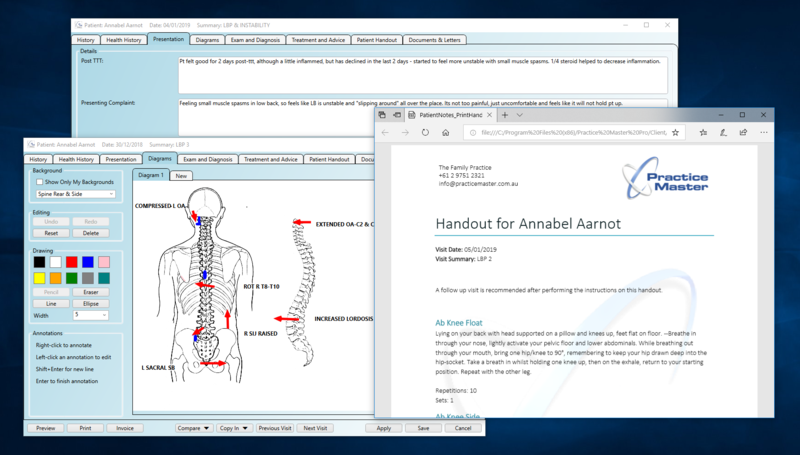 Practice Master supports multi-disciplinary practices through the use of template-based patient notes. 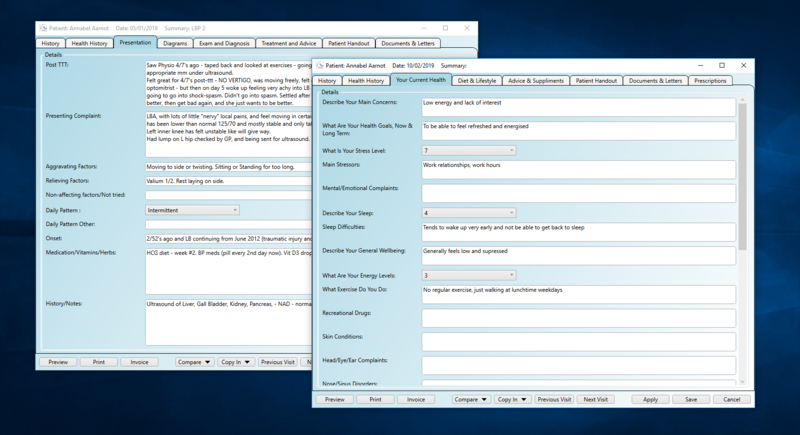 Of course, if you only practice a single modality you can still benefit from the use of templates by creating an 'Initial Consult' template to use alongside a 'Follow Up' template. You can also separate specific questions in to their own templates like 'Pregnancy' or 'child' templates. There are many ways you can speed up your note taking by taking advantage of features like 'Copy In' to copy in a previous set of notes where only minimal changes have occurred. You can also take advantage of faster question types like multiple choice, tick box, lists or questions with pre-defined text answers. 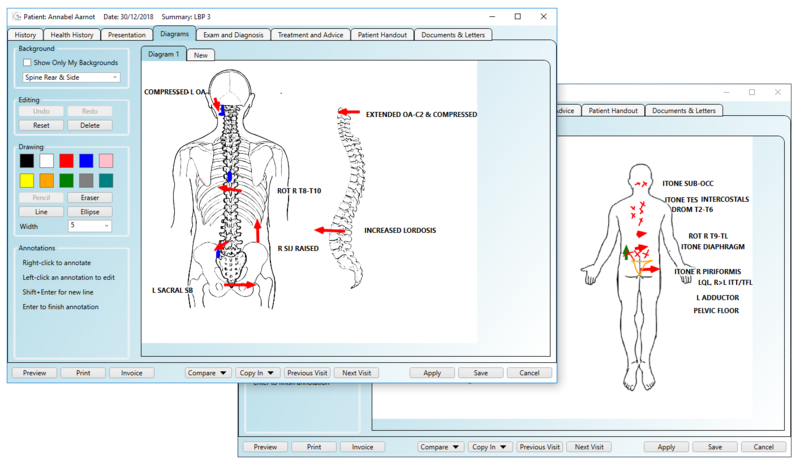 We have taken a familiar approach to diagrams and streamlined it specifically for annotating and highlighting your own custom medical diagrams. 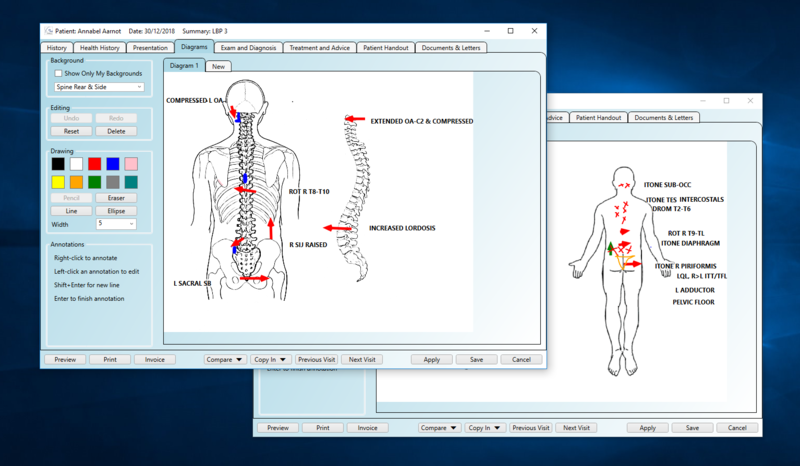 Draw or annotate over the built-in backgrounds or add your own to create professional high quality diagrams for your patient notes with remarkable ease. You can add multiple diagrams to each visit and with a 'left click' you can draw freehand or lines and circles/ellipses. To quickly annotate diagrams, you can use a 'right click and type' approach anywhere on the diagram. Diagrams can be a fast, visual way to construct your patient notes and you can even include your patient in the process. This makes it more interactive for them and can help remove the computer as a barrier between patient and practitioner. 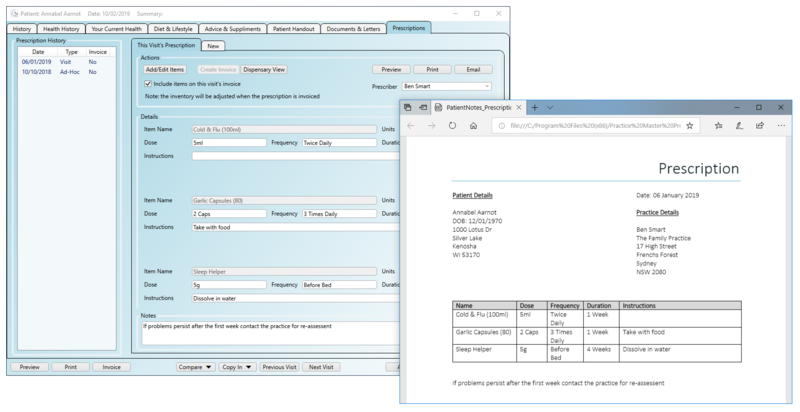 If you dispense any medications, herbs or mixtures from your practice then you can benefit from using the dedicated prescriptions tab. It is available in the patient record as well as in the patient notes. 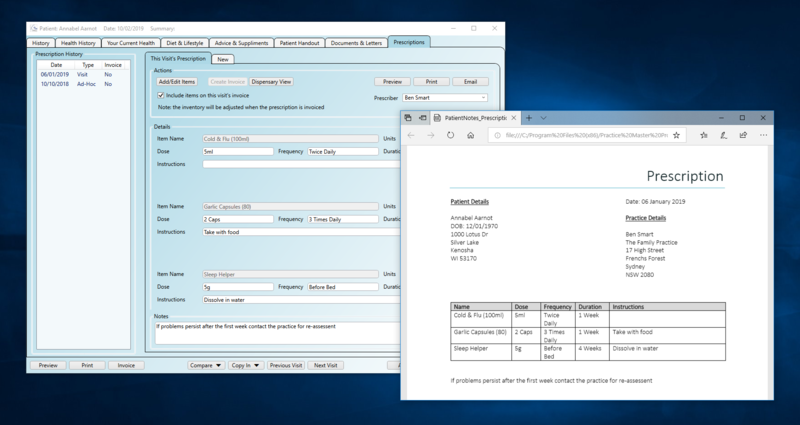 Prescriptions integrate with accounts so you can invoice for the prescription specifically or you can include the items automatically on your patient's visit invoice. Prescriptions also tie in to the inventory so stock will be deducted automatically and you can benefit from stock level and expiration date alerts. 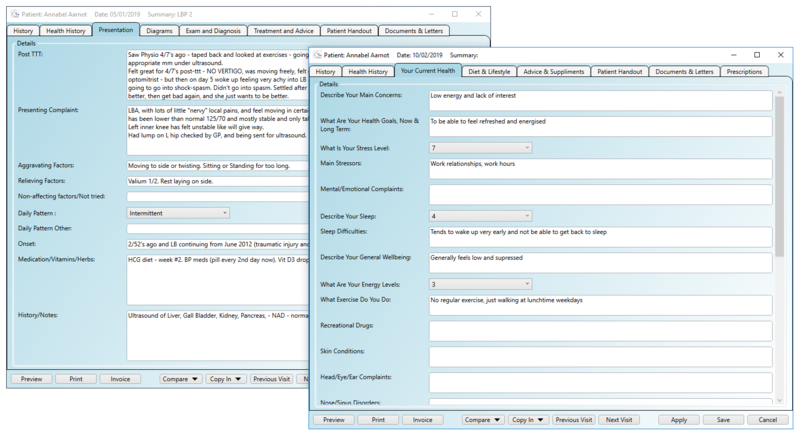 If you prepare your own composites/mixtures/packs they can also be added to prescriptions and a 'Dispensary View' can list the component parts to help with their preparation. 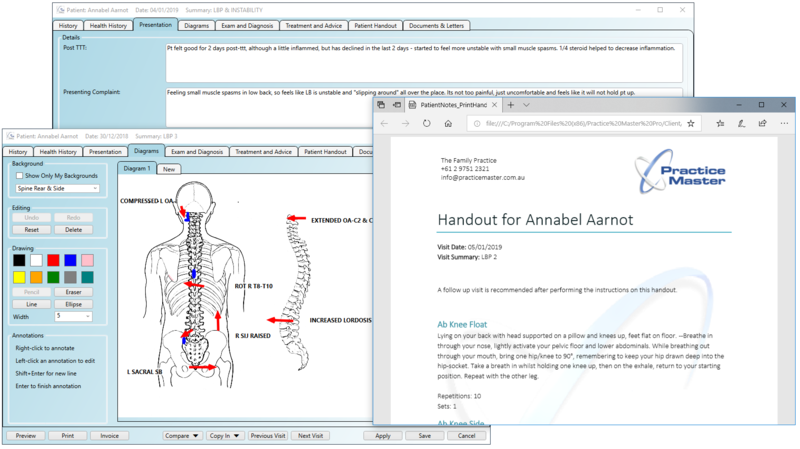 If you give your patients handouts or any information to take home then it is likely that you have a selection of 'template' documents on your computer that you copy, edit and print/send to your patient each time you use them. Practice Master lets you import these straight in and using built-in merge fields you can generate them with a single right-click. Documents are automatically stored in the patient's record or patient notes and can be printed or emailed straight to the patient with a single click.